9X Series motion controllers provide real-time motor phase current adjustments to compensate for load variance. The operator simply sets the maximum current for the application and a load variable that indicates a motor stall. Easily find mechanical hard stops for sensorless operation, or use Adaptive Torque Control to achieve as much as 50% in energy savings. In the example below, the maximum current is set at 70%. The controller automatically determines phase currents and adjusts in real-time. On this lead screw application, only a peak current setting of 35% is needed during start-up. The run current at speed is reduced to 10% of maximum. 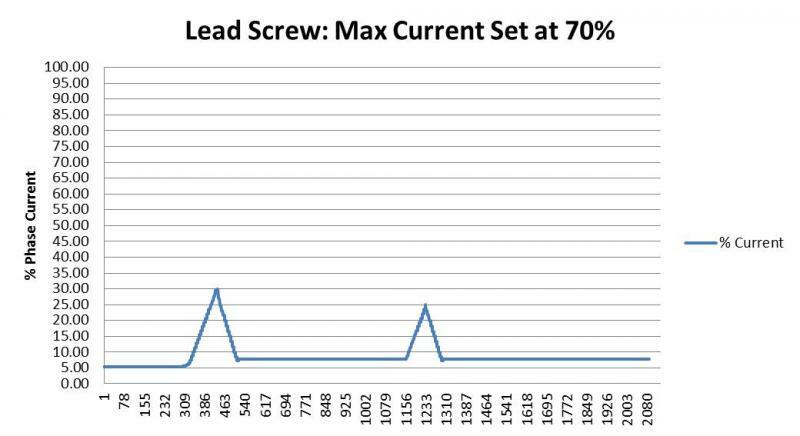 At step 1150, the lead screw exhibits some resonance which requires 25% of maximum to avoid a stall condition. The controller then returns to a run current of 10%.